The Circumstances. Thirteen years after a one hundred day nightmare when almost one million people died, many at the hands of neighbours and people they considered friends, the majority of those who lived through that time remain emotionally traumatized and deeply wounded. In fact, much of the hustle and bustle of Rwanda’s capital city Kigali is not being generated by those who endured the one hundred days of genocide: much of the activity is being generated by former refugees, returning home after many years away from their homeland to help rebuild their nation. They have re-introduced a spirit of liveliness and optimism but for those who lived through the trauma, moving on is no simple task. Unlike what many believe, the dividing line of the genocide was not tribal. The fact is that the Rwandese is one people; the labels were merely traditional economic distinctions that were rather benign until they were exploited by colonizing powers as a means to divide and play favorites…to tragic results. The Challenge. Even church and community leaders have said openly to Pastor Eddie that they would like to be first in line for counseling for emotional healing. During our team’s stay in the midst of the lively capital, where road paving and building construction can be seen everywhere, not one person who heard us say “we are hear to design the facilities for a peace and reconciliation ministry”, failed to comment that this will fill a great need in their nation. The Ministry. African Link Developments, spear-headed by Eddie and Bonita Mwunvaneza, has a vision for a place where professional counseling for individuals can take place, where families can come together for healing, where vocational training can occur for widows and where activities that involve and bring together a whole community can happen. Pastor Eddie is himself a former Rwandese refugee. Raised for a time in Uganda and mostly in Canada, Eddie is burdened with the task of “returning home” to be catalyst in the healing of his nation. As one who follows Christ, Pastor Eddie knows that healing of the emotion is not enough if there is no healing of the soul. His aim, therefore, is to bring into the healing process an opportunity to hear and know the Good News. This is therefore a centre for peace and reconciliation not only of people to people and people with themselves but also a place for spiritual peace and reconciliation as well. The Task. The goal of the eMi team was to master plan the 2.3 acre hillside site and design all the required facilities and infrastructure. Experientially the planning would take advantage of the beautiful sweeping views, the existing vegetation and the natural fall of the land for building placement and the location of pathways to both quiet places of contemplation and prayer as well as places of group activities and sports. In terms of engineering the team needed to understand the structural as well as absorption capabilities of the soil. 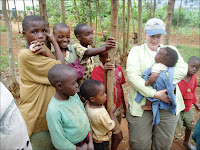 Rwanda is rain forest nation with periodic deluge of very heavy rainfall. Managing surface water run-off on a hill-side site will be critical; making it part of the architectural design would be a huge bonus. The Work. In a week that began with listening to Eddie share his vision, the eMi team then investigated local construction practices and building materials. The team walked the site numerous times while the surveyor (David) and his helpers (daughter Ashli and intern Philip) began to document its boundaries, topography and features. Architects Dan and Beth concentrated on site planning and building design while architect/builder Mike looked after material specifications and a construction cost analysis. 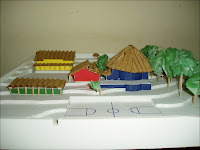 Structural Engineer Phil work closely with the architects to establish the structural systems of the buildings (in the end three types were used) while Civil Engineers Rod and Joyce analyzed the soil and the water and designed both the fresh water and waste water systems. As for me I coordinated all events of the week as I did my best to find a balance between research, work, ministry, team devotional time and simple relaxation. And yes, we found time to buy souvenirs for our families back home. The Ministry. Besides the fundamental need to complete our task a huge part of eMi is ministry time. This essentially means time spent with the local population, to care for needs and share our time and attention. For us this was often as simple as playing with the neighbourhood kids at the property. All of us visited an orphanage and a home for abandoned children with mental and physical challenges. While there we gave away clothing, foodstuff and lots of stickers and even candy. Most of all we gave our hands and arms to hold, even if it was just for a while during that day. Some of us met with a group of young adults who were encouraged by our desire and willingness to travel halfway around the world to come alongside Pastor Eddie in his ministry. A few of us spent time teaching widows how to make jewelry with simple found materials (hey, they were really beautiful!) so that they could earn some money. 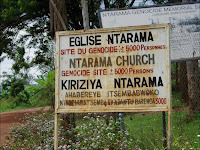 We visited two genocide memorial sites and stayed a while to interact with the local children. And in all this we tried to learn some local greetings, to make an effort to really be in the place and not merely passersby. We got laughed at a lot for our efforts but it was always in good spirit as our efforts were appreciated. The Results. The team did a fantastic job all week. It had been an emotionally challenging week but everybody found the strength to remain focused on our task. In the end Pastor Eddie sat silently and absorbed our Final Presentation. In the end we were pleased because he was pleased. At eMi was often say: “in the end, it’s not about a building.” Although very true, our primary task as a group of professionals is to deliver the right design. I am proud of the work of the team as they designed a counseling/guest house center, a vocational training centre, a beautiful multipurpose building with traditional Rwandese influences and a staff-housing block. Also on the site are several gazebos in quiet locations, a grassed play area for kids, a basketball/group activities court, car parking that is out of view and a delightful surface drainage system that integrates with the site circulation with little bridges. My Experience. This was an emotionally and even spiritually difficult and at times very painful trip. By mid-week after visiting the genocide memorial sites I found myself despairing and almost wishing to leave. But Pastor Eddie kept telling us: “The story is not finished. You are here to continue the story with healing, reconciliation and hope.” His constant reminder re-invigorated me and our team and we were able to complete our task with praise and thanksgiving. Project Photos. A new set of photos has been uploaded to my Photo Gallery for this project, so click here (Photo Gallery) and see the Kigali, Rwanda set with a slideshow (click the middle of the photo for commentary). If you want to spend a little more time looking and reading click here in Details (Photo Details). 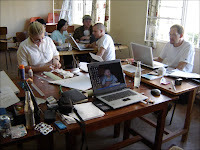 Check it out and see what your support and encouragement has produced in the work of this team. “Thank you” to all our prayer and financial supporters for making this project a reality.